I will be the first to admit that I don't drink enough water. So I've been making caffeine free herbal iced tea to tempt myself into not getting dehydrated - especially since we're "running" about three times a week in the terrible heat and humidity. Today I tried a new flavor. 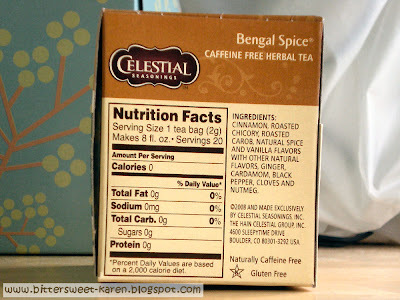 Celestial Seasonings Bengal Spice. I took my first sip. Mmmmm, spicy. And . . . oh no . . . sweet. Quite sweet. I could taste the sugar in there. Or perhaps it was honey? I wasn't very happy because I usually chose drinks I don't have to bolus for. 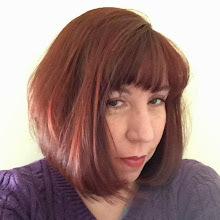 (Kindly refrain from pointing out all past martini mentions.) What exactly was in the tea? Actually, what is in the tea is exactly what the box lead me to believe. A blend of herbs and spices. No sugar or honey. No carbs. 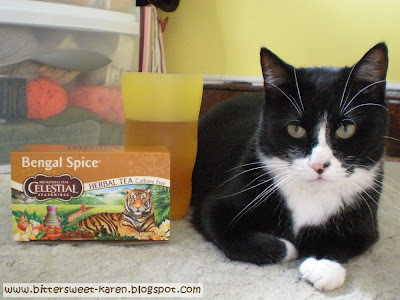 So I must give a tip of my hat to Celestial Seasonings for a delicious cup of tea with a yummy honeyed flavor. 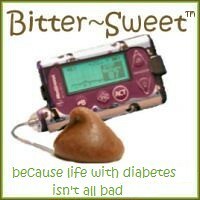 And not having to bolus for it was a very sweet surprise. ** Seriously, it took FOREVER to get that picture of K.C. next to the tea. Every time I put the box down near her, she got scared of it and ran off. (Because yes, a box of tea is terrifying! I would've thought she'd dig the tiger on the front.) I followed her around the house until, I guess, she got too tired to run any more and let me take my stupid picture. 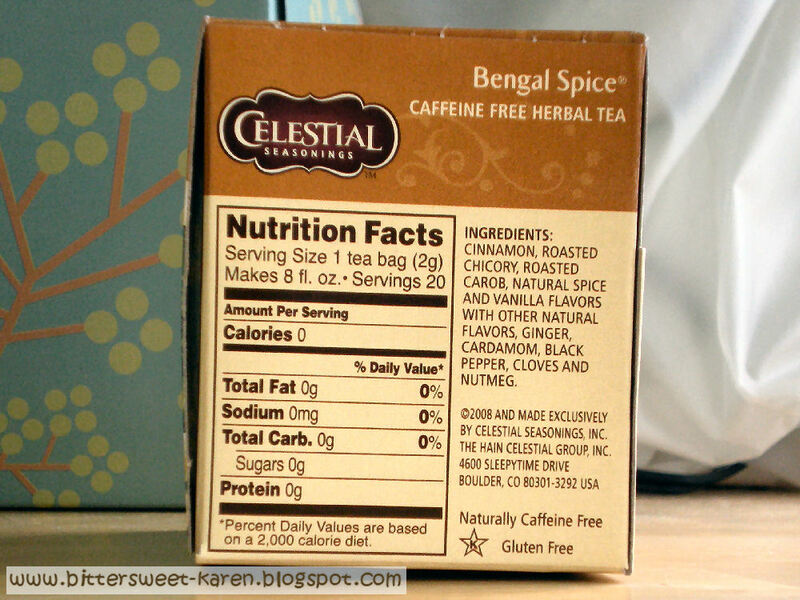 I love Celestial Seasonings Blueberry Tea. It tastes like it should have sugar in it, too. decaf ginger peach is amazing too. And I was wondering what all was involved in taking that picture!!! I'm so glad you let us in on the details! In winter, Bengal Spice hot with milk is very yummy. I suspect it's like chai, without the sugar (but with the sweetness). ps...the pic with the kitty is adorable! If you ever come out to Colorado you should visit the Celestial Seasonings tea plant, near Boulder. Awesome gift shop, great tours and a pretty good cafeteria. Plus, they give out lots of free samples. I'll second the recommendation on the CS plant--awesome experience, especially when they open the door to the room where all the peppermint is stored. If you're looking for a "sweetish" tea that is diabetes-compatible, you might want to try rooibos ("red bush" in Afrikaans) or honeybush tea. They're both naturally sweetish tasting, without the sugar or honey. Very good. I adore tea. But I’m partial to loose leaf orange pekoe. My Jenna, however, is a tea aficionado in training. She loves Celestial Seasonings Blue Berry and Sleepy Time best of all. But she has enjoyed Rooibos tea since toddlerhood. I love that about her, being a lover of tea myself. Btw, I was wondering why kitty looked rather unimpressed. When I read you had chased her around the house just prior to taking the picture it all made sense. Made me chuckle!